What do the news and entertainment media have to do with gun violence? Speaking on a panel at the University of Pennsylvania’s 2018 “Teach-In,” Annenberg Public Policy Center (APPC) research director Dan Romer looked at the connections between the media and three kinds of firearm violence — suicide, homicide, and murder-suicide. He emphasized the effect on youth, people ages 15 to 24, since they bear a disproportionate burden of gun violence “and there’s good reason to believe that is directly associated with their heavy use of entertainment media,” he told the crowd at the LDI-Penn Injury Science Center Session on firearm violence. 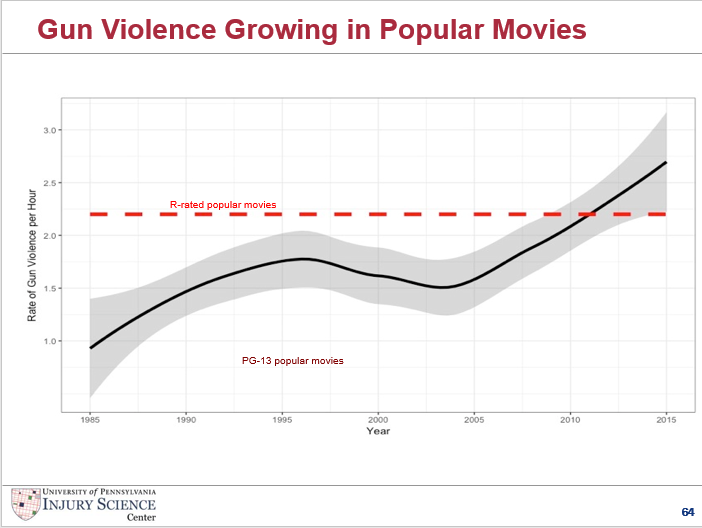 Romer also cited research that he and colleagues at APPC have done on gun violence in popular movies, finding a rapid growth in the amount of gun violence in PG-13 movies, which are open to children. The amount of gun violence in PG-13 movies surpasses that in R-rated films, which are restricted to adults, according to their 2017 paper in Pediatrics. Gun violence in popular PG-13 and R-rated movies. From Dan Romer’s presentation.